With cheesecake on the bottom and apple pie on the top, apple cheesecake pie is the perfect blend of two dessert favorites! Prepare an uncooked pie shell in a 9 inch pie plate. Set aside. In a medium bowl, beat the cream cheese, powdered sugar, vanilla and egg together until smooth. Pour into the unbaked pie shell. Set aside. In a medium microwave safe bowl, toss the apples with the lemon juice, brown sugar cinnamon, and flour. Microwave on high for 2 minutes. Apples should be slightly softened. Stir and pour over the cheesecake. Bake at 375 degrees for 30 -35 minutes. Center should be nearly set. Cool on a cooling rack for 30 minutes, then chill in the fridge for at least 4 hours. For the icing. 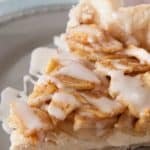 whisk together the powdered sugar, vanilla, and milk until it is smooth and drizzle over the pie or over individual slices of pie to be served.